NTT: Trained in pre-primary education. TGT: English, Mathematics, Science (Physics, Chemistry, Biology) Social Studies (History, Civics, Geography, Economics), Hindi, Assamese, Computer Science. (Minimum 5 years of teaching experience). Candidates should be Graduate/Post Graduate in the relevant teaching subject for PRT & TGT .B.Ed is must for all above mentioned posts. Music Teacher (Instrumental), Lab attendant. 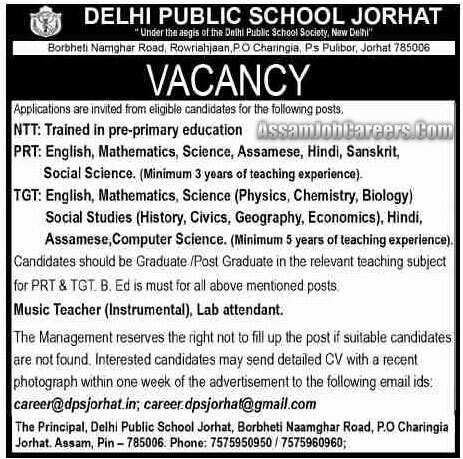 The Principal, Delhi Public Schoo Jorhat, Borbheti Naamghar Road, P.O Charingia Jorhat, Assam, Pin - 785006. Phone: 7575950950/7575960960.